This is a guest post written by Tim Robertson. Tim is the owner and publisher of MyMac.com and a freelance writer. While both Microsoft and Sony are trying to bridge the gap between traditional media content (TV shows and movies) and video game consoles, Nintendo has taken a different approach. 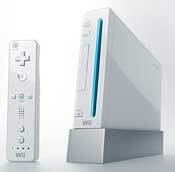 The Wii is marketed as a device for gaming, and not much else. 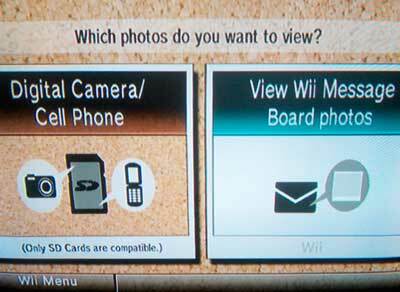 Nintendo did include the ability to read external media with a built-in SD card reader on the front of the Wii. (That’s what is hiding behind that small door.) You can either use a SD card to save your Wii game saves, or use it to transfer content to the Wii. I decided to give the Wii a try as a video player by converting some DVDs to .MOV format (The only format I have found the Wii can play) and see how well it did. Rather than draw this out too long, the answer was “not too well”, at least not at first. Small cellphone videos look terrible, while DVDs converted at a decent resolution played somewhat better. The Wii only supports videos in .MOV format, although there were some .MOV files that the Wii refused to play. To play videos on the Wii from an SD card is very unintuitive. You have to go into the Photo channel, navigate to the SD card, and find the .MOV files there. While video files are one type of media the Wii will play, MP3s are the other. Like .MOV files, you have to navigate to the Photos channel, then the SD card, and finally your MP3s. Playlists don’t appear to be supported, so unlike with the Xbox 360, you can’t create your own gaming soundtracks. External media on the Wii seems more like an afterthought, rather than a feature. The Wii is no media center, and so far does not play nice with media you may have on your home network. No streaming photos, videos, or music. While a system update could address this issue, it appears to me that Nintendo will content itself to let Sony and Microsoft innovate at playing nice with networked content. It’s hard to argue that Nintendo is wrong to take this route, as the Wii has trounced the PS3 and Xbox 360 month after month on the sales chart. Still, in the area of home networks, streaming media, the AppleTV, P2P, IPTV, and other technologies we don’t even know about yet, the Nintendo Wii is really just a gaming machine. I tried the wii browser with ABC live streaming and it would not work. “The Wii is no media center… really just a gaming machine.” Yes, it’s what it was designed to be, and it’s not what you tested it as. Good for Nintendo. Whilst it clearly isn’t intended as a media center, it works very well at accessing Flash-based video online. And sales-wise it’s trumped the others as a gaming device too. orb works great! stream all your media anywhere for free! Yeah, even though this may seem like propaganda, I agree with Thomasvanommeren. Orb.com actually lets you stream video files (.avi, .wmv, probably others but I use those) and audio files (.wma, .mp3) and even picture files from your computer to your wii (or x-box or ps3) for free, and (on my faster connection) there’s no significant loss of quality. Somehow, it trans-codes those files into flash format and streams them directly to your wii (if your computer and your wii are on the same connection), or to the website which your wii can access (if they aren’t). It’s awesome: no more making DVDs out of my computer’s video files just to watch them on the TV!